ABBYY /ˈʌbɪ/ is an international software company that provides optical character recognition, document capture and language software for both PC and mobile devices. 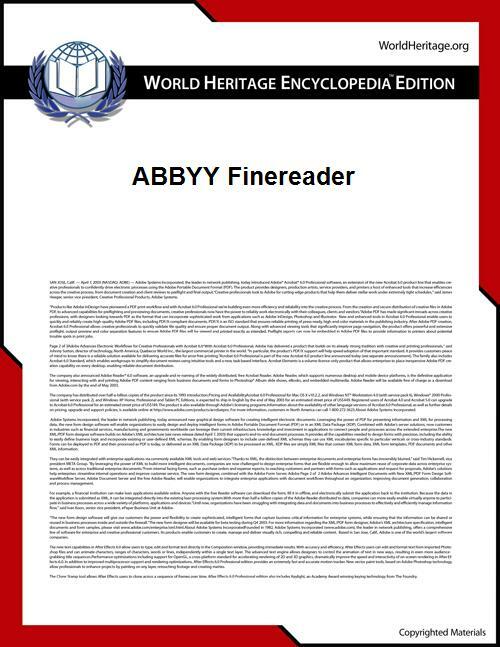 The majority of ABBYY products, such as ABBYY FineReader, are intended to simplify converting paper documents to digital data. ABBYY also provides language products and services. ABBYY was founded in 1989 by David Yang and was named BIT Software before 1997. ABBYY Group headquarters are located in Moscow with representative offices in Germany (Munich), the UK (Theale), the USA (Milpitas, CA), Japan (Tokyo), Taiwan (Taipei), Russia (Moscow), Ukraine (Kiev), Canada (Ontario), Australia (Sydney), and Cyprus. In 2007, a branch specializing in publishing dictionaries, reference books, encyclopedias and guide-books, ABBYY Press, was established. ABBYY also owns ABBYY Language Services, a high-tech translation and localization agency. ABBYY's software understands text-characters in images. The FineReader converts scanned images into editable file formats and has received a four-out-of-five rating by PC Magazine. FlexiCapture is data and document capture software that converts documents into electronic form. The ABBYY Recognition Server is an Optical character recognition server and document capture software. ABBYY also develops a PDF conversion kit, a software development kit, dictionary and translation software and other programs. As of 2011 and 2012 ABBYY is working on a usable version of its new machine translation and text semantic analysis system named ABBYY Compreno. At the beginning of 2011 ABBYY received a grant of 475 million Russian roubles (about $15 million USD) from Skolkovo innovation center for the development of its Compreno technology. The technology is supposedly based on USH (Universal Semantic Hierarchy). Syntactic Parsing Technology is used to complement the USH. The approach will allow for both the in-depth syntax analysis of the source text and the differentiation of subtle details of meaning based on world- and subject-knowledge. It is prospected to be used for intellectual information search based on abstractly defined content and expressed ideas / involved subjects (regardless of specific terminology and vocabulary used), as opposed to currently widely used keyword searching. ABBYY Business Card Reader is a mobile software application that imports contact information from business cards directly to mobile address books using a smartphone's camera and text recognition technology. First released in 2009, the application is now available for Symbian, Apple iPhone in January 2010, and Android. It uses ABBYY's optical character recognition (OCR) technology for mobile devices, which was introduced to the market with ABBYY Mobile OCR Engine. Currently, the application supports 20 languages, including popular European languages and Korean, and reads both monolingual and multilingual business cards. The software has received positive reviews in Russian PC Magazine and Macworld Australia. PC Advisor commented, in 2005, "FineReader 8.0 Pro is the best OCR software we've seen" while PC Magazine gives it four stars out of five. Also in 2005, PC Pro gave FineReader four stars out of six, saying, "FineReader offers a decent compromise between the value and accuracy of Readiris and the power and automation features of OmniPage. If you need automation on a budget, it's the package to go for, but for home and occasional office use Readiris is the better package at this price." In January 2007 the FineReader Engine (an OCR SDK) was selected for use in Ricoh's DocumentMall document management system. In March 2011 ABBYY was selected for KMWorld 100 Companies That Matter in Knowledge Management Award (for the fifth year in a row). In May 2006 ABBYY USA was awarded the Fujitsu Quarterly Innovative Leadership Award. ABBYY claims that the company name means "keen eye" in the hypothetical reconstructed parent language of Miao–Yao, Nu, Hmong–Mien, Hmong and Kim Mun groups of the Sino-Tibetan language family.